I never asked for this... but I'm extremely happy that it exists. 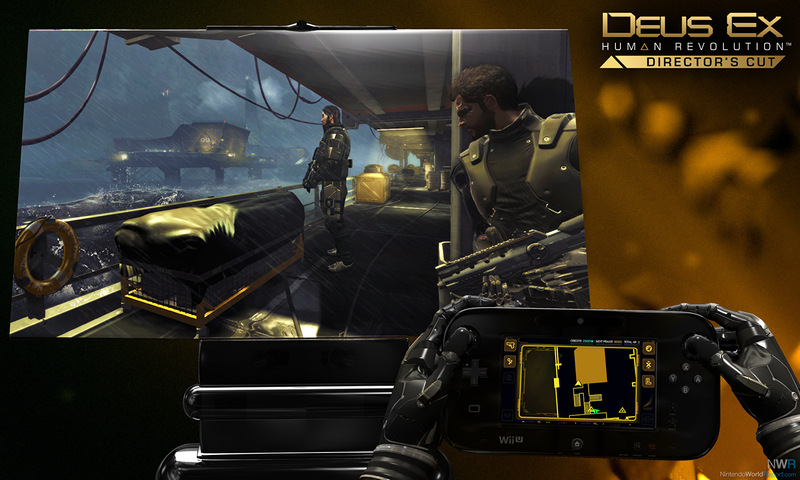 Deus Ex: Human Revolution hit the Xbox 360, PS3 and PC in late 2011 to critical acclaim. Combining an open world first-person cover shooter with a western-style RPG along with an extremely thought-provoking story, easily made it one of my favorite games of 2011. Fast-forward to today, Square-Enix has re-released the game, under a special “Director’s Cut” label, for all current-gen systems, despite it originally being a Wii U exclusive. After playing this game on Nintendo’s home console, it’s hard to imagine that this already fantastic game could provide a better experience on any other platform. The story involves our hero, Adam Jensen, who was inflicted with a life-threatening mutilation while he was on an important mission. Sarif Industries, the company he works for as the Chief of Security, rebuilds parts of his body with enhancements called Augmentations (or “Augments”). Adam is met with resistance, due to the ever-growing backlash against Augments and his own objections. Though, since he’s the only man capable enough to put a stop to purist, anti-Augment terrorist groups, he tries to put all of his qualms behind him. While the story can be really interesting and makes you question your own morals, the game really shines through its one-on-one conversations. Even if they don’t look as nice or fluid as the dull pre-rendered cutscenes that show up during key points, the writing is phenomenal and makes you really care or despise whoever you’re talking to. At times, you can lead the conversation into different directions or get different reactions by choosing various pre-determined answers or responses. Based on how you upgrade your character, you’re also given special persuasion choices which can net you extra items, experience, or weapons. While it doesn’t affect a ton of things that happen in the long-run like the Mass Effect series or Telltale’s The Walking Dead, it’s a nice way to make your experience a little less frustrating. The game takes place primarily in a futuristic, run-down Detroit, which serves as the game’s central hub.You start off doing a few missions and side-missions here before you’re flown to places like China, Montreal and more. Doing these missions earn you experience points, which in turn earn you Praxis points. These Praxis points allow you to upgrade your various Augments, such as improving your hacking ability so you can get inside locked doors and access restricted computers that give you extra running speed, upgrade your bag of weapons and items, and much much more. Unless you comb every single square-foot of this game, it’s highly unlikely that you’ll be able to completely fill up every single stat boost. If you’re like me when I first played the game and tried to spread things out evenly, your skills won’t be high enough to really do anything. I would recommend focusing your Praxis points on one or two specific areas, depending on how you like to play. Deus Ex offers various ways of approaching how you progress through the game. If you want, you can go through the game guns blazing, or take a more stealthy, pacifist approach by just sneaking behind various guards and enemies, and/or knocking them out. While the game doesn’t really penalize you for using guns, you do get more experience points by non-lethal takedowns, and surrounding enemies are less likely to be alerted to your presence. Whichever option you choose, you can raid the bodies of your enemies and get extra ammo, information, and Credits(the game’s currency to buy more weapons, ammo, grenades, and even Praxis points). The gameplay itself is a lot of fun, and is by far one of the most satisfying shooters I’ve ever played. While I would’ve enjoyed the option to use a Wii Remote Plus and Nunchuck to control and aim, playing the game with the Gamepad is more than sufficient. Since the game is a bit slower paced and not as twitchy as most first or third-person shooters, it doesn’t suffer too much from using a dual-analog stick setup. Moving, aiming, leaning against walls, and shooting are all extremely fluent, and the enemies are smart enough to try and find you if they see or hear you, making the game even more intense. Where the “Director’s Cut” comes into play here is half with the Gamepad, and half with gameplay tweaks and additions. The Gamepad can serve as an extremely useful, constantly active map, which was a pain to navigate in previous editions of the game. You can even draw on the map, making it easier to get yourself on the right path when navigating large, open cities. In addition, you can directly access your inventory, Praxis allocation, mission status/updates, and more right on the touch screen. You can even make special Infologs, by taking a picture from your current position and adding a short voice clip.This feature allows you to post these Infologs to Miiverse, but that functionality was not yet active at the time of this review. Other additions include special developer commentary for key points and areas in the game. When turning this feature on, you can activate the commentary at said points by pressing the - Button. I would recommend using this feature if you’re super familiar with the story and writing already, as it tends to overlap with the game’s dialogue. The game also includes a built-in strategy guide, which provides walkthroughs and fills you in on the game’s different locations and secrets. You have to go into the Pause menu to actually read the guide, so trying to go back and forth between the two can get quite annoying. Though probably the biggest and best changes to the game are the boss fights. In the original game, these flow-breaking boss fights were the most heavily criticized, as they were both unfairly difficult and force the player to use a weapon, making pure pacifist runs of the game impossible. The game fixes these issues by providing new areas in the boss room for players to explore, and provided they have a suitable Augment upgrade, they can take down the boss without having to fire a single bullet. Though some of these rooms have a clear vantage point, so if you want to unload your gun on the boss, and not have to worry about them coming after you, then it makes the fights that much easier. I personally would rather take an easy boss fight over the atrociously designed and one-sided fights of the original release. 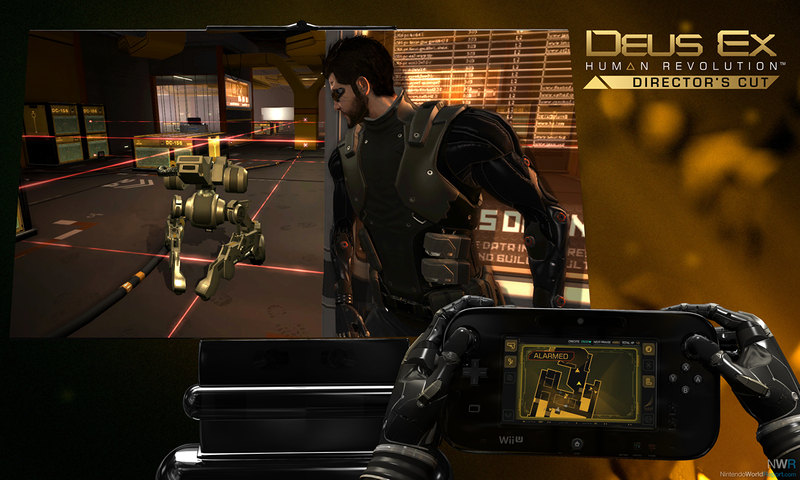 Deus Ex’s graphics and sound on Wii U are on-par with the PS3 and Xbox 360 versions of the game, and runs anywhere between 25-30fps at any given moment. While there’s no real game-breaking glitches, some enemies will clip through walls if you try to knock them out in small areas like bathrooms. The music is soft and moody, but kicks up when there’s lots of action going on, really making the game more suspenseful. Character animations can also be stiff, unnatural, and just plain weird, which is something the game has suffered from on all platforms, so while there are well-written conversations as I described earlier in the review, it’s a bit jarring to see the characters move their arms so unnaturally. The voice acting is a bit of a mixed bag too. While the main characters sound fine, some of the minor characters, specifically Chinese and African-American ones, often sound unnatural and stereotypical. 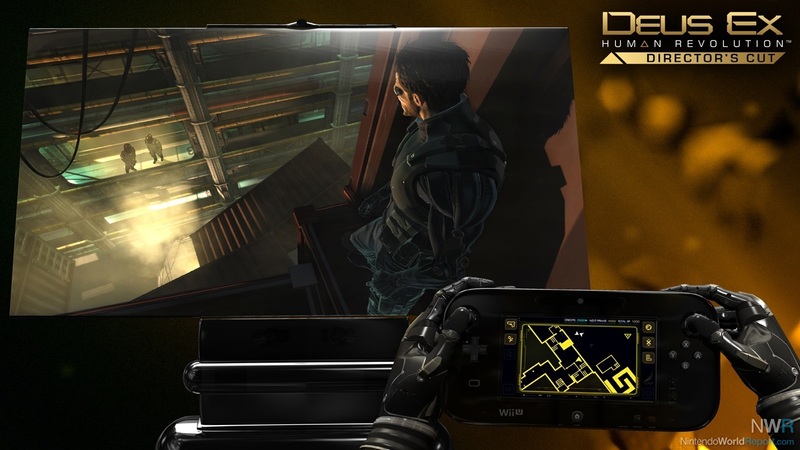 It’s safe to say that if you don’t have a high-end PC, Deus Ex: Human Revolution - Director’s Cut on Wii U is the definitive version of the game. Sure you can get second-screen content on the other systems, but you would need either a PS Vita or a smartphone on PS3 or Xbox 360 respectively to enjoy it, and even then it’s not as convenient as using the Gamepad and having every single necessary button and feature right on the fly. This is both a worthy upgrade and worthy introduction if you’ve never played a game in the series before. The game may be augmented, but they’re augments made for the betterment of mankind. I am tempted to get this since Watchdogs is delayed. I don't know if I can bring myself to spend $50 for it though. I am speechless already. Never in my entire existence have I ever seen a Wii U title earning a PERFECT SCORE! 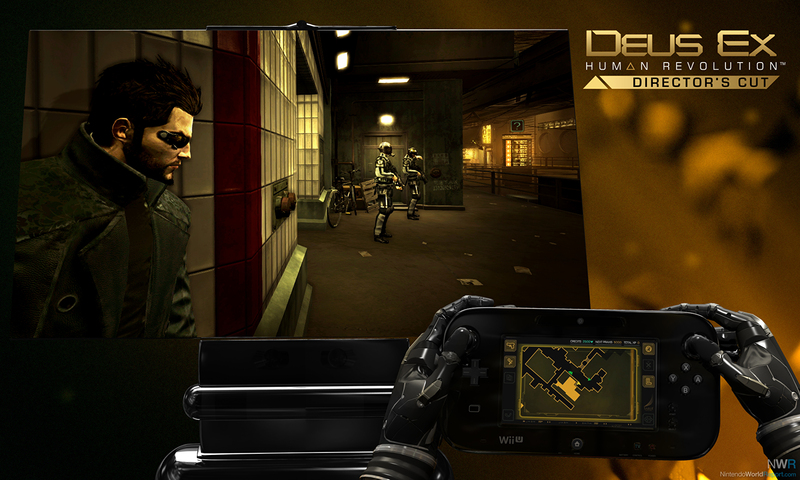 Although it's $10 more than the PS3 and Xbox360, the Wii U version of Deus Ex is THE game! Outstanding job on the review! Hopefully this game sells well and we get more third party games, especially new ones from Sqaure Enix. Wind Waker HD did last month. I don't think Square-Enix has too high of expectations for this particular port. After all, it was previously released two years ago, and a lot of people won't be rushing out to buy it. That said, whether we get future support from Square-Enix or not does not necessarily depend on this game. Yes, it would be nice to show support, but something tells me that as WiiU sales continue to grow, S-E will be forced to look again at WiiU and maybe perhaps port some of their more ambitious projects onto it (I'm looking at you, Kingdom Hearts III, although I think we may eventually get it). They did say (sorta) they were OK with how DQX fared in Japan and are going out of their way to give it another extension pak this December (way after this game launches). So I wouldn't take this as a sign that S-E will up and ditch WiiU after these two. If they were upset with how DQX fared on WiiU, we wouldn't even be getting the expansion pak. Nor this. Period. How many features are exclusive to Wii U? 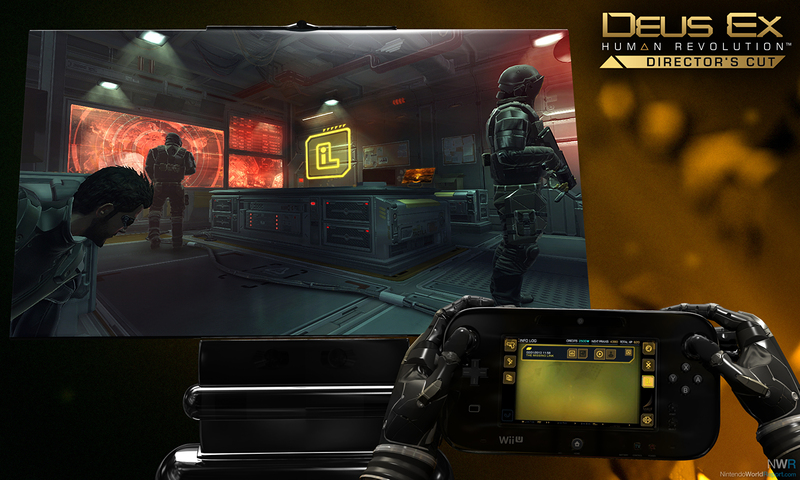 I would like to see a comparison of all of the second screen features between the GamePad, Vita, and Smartglass versions of Deus Ex: Human Revolution – Director’s Cut. Wait for the inevitable price collapse. I will likely pick it up when it does despite not getting a Wii U anytime soon. I expect it to be shipped in small enough numbers such that it might be difficult to find when I do pick up a Wii U (but not so small there isn't some kind of price drop).